Home / angelic beings / Angels / believe / Bible / children in church / christian / comfort / God's messanger / guide / protect / worship God / Do You Believe In Angels? When I get up really early in the morning I watch touched by an angel, it’s a series about angels – they are given assignments by God – people that really need help. They appear in people’s lives, there are no wings but seemingly ordinary people working and living alongside them. There are usually three angels but occasionally they need a little help. It’s an old series now, but the message of God’s love comes out in every episode, it also gives a different picture of angels, that they are not dressed in white with wings and a halo. So do you believe in Angels? I do, they are very biblical. Throughout the bible from the very beginning angels are mentioned. In fact, they are mentioned in the bible 300 times. The definition of an angel is a heavenly being who serves as God’s Messenger. The word for angel in Hebrew is malak and in Greek it is angelos. These terms not only mean God’s messengers, but also mean human beings as messengers. Ex 23 20-23 See I am sending an angel ahead of you to guard you along the way and to bring you to the place I have prepared. Pay attention to him and listen to what he says. Angels are messengers sent by God to deliver a message, they are like heavenly postmen. We are to listen to them, and hear the message and act on it. Daniel – 10 12 Then he continued, “Do not be afraid, Daniel, since the first day that you set your mind to gain understanding and to humble yourself before your God, your words were heard, and I have come in response to them. Verse 16 – Then one who looked like a man touched my lips, and I opened my mouth and began to speak. Verse 18 – Again the one who looked like a man touched me and gave me strength. This wasn’t an angel with wings but a man, but Daniel knew they were heavenly beings. Angels of the Lord with a message from God. Daniel gained strength and felt comforted by the angel’s visit. 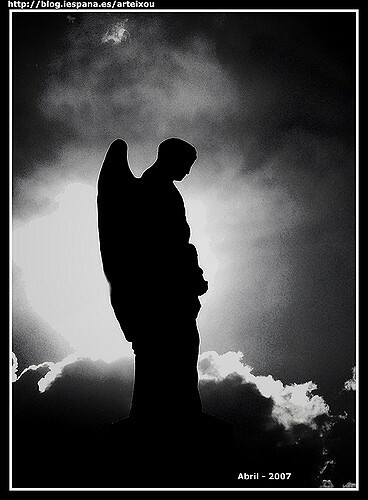 Whilst most angels appear as ordinary human beings, in Isaiah 6: 2-3 6 the angels had wings. They were described as seraphs – which are angelic beings singing God’s praises. No-where in the bible are Angels described as cute and cuddly little babies, they are always described as fully grown adults. When people in the bible encountered them many times their response was to fall on their faces in fear and awe..
Angels have a variety of jobs throughout the bible. · Worship God – Isaiah 6:3 Holy, Holy, Holy is the Lord Almighty. · Messengers – delivering messages to Joseph, Mary, Zechariah and many others. · Guide – They guided the shepherds to Jesus. · Caring for believers at the moment of death – Luke 16: 22 The time came when the beggar died and the angels carried him to Abraham’s side. This isn’t all the examples of what angels have done throughout the bible and I can’t believe that the angels work ended when the bible was finished. I believe in angels as people have come into my life with messages from God, to protect, guide, encourage me. I haven’t seen any with wings, but I believe that when I die an angel will be with me to take me to be with God. I wonder how many of you have been visited by an angel with a message from God? Angels are something most children recognise, but they are also just associated with Christmas. Perhaps talking about angels at a different time of the year will help them to understand what angels truly are and help them to watch out for them. At Easter one year – I led an Easter workshop in which the children dressed in white and processed from the village hall to the church. It was quite a procession, then in the church the children performed a drama around angels. Angel Story in Easter Cracked by Scripture Union. A few years ago I ran a summer holiday club – 'Angels in Training' set in heaven. Every day another bible character would come and tell them their story. At the end of the morning ‘God’ would talk to the children. At the end of the week, every child received a wing badge and certificate for completing the basic angel training. They entered heaven through the Golden gates with Golden angels protecting the entrance and I used lots of voile to create the feeling of the sky.. with stars..